We have reached the penultimate degree of grandeur. At the outset of our trip, we passed near the Grand Ole Opry. A few weeks later we visited Grand Coulee Dam. We have now reached Grand Teton National Park. The Grand Canyon awaits down the road. 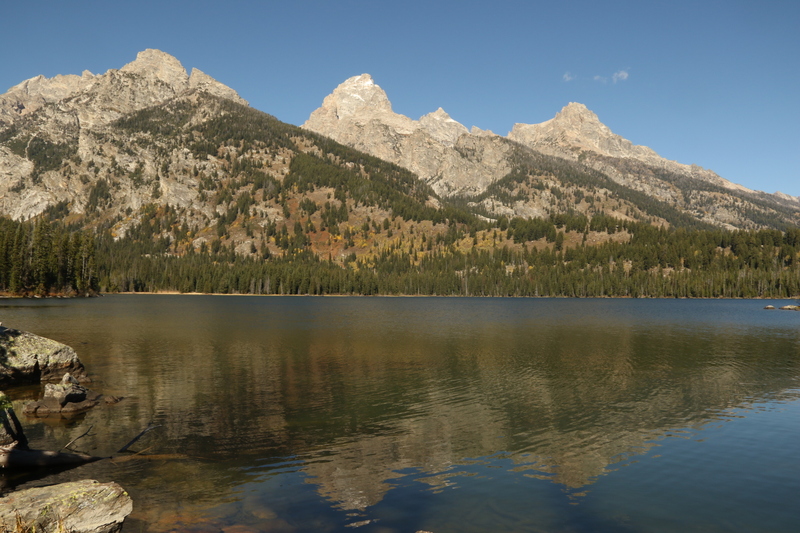 There are few images in American park lore as iconic as the Tetons. They jut way up into the sky from a generally flat landscape. There are plenty of mountains in the general vicinity, but the Tetons dominate, most prominently Grand Teton, at 13,770 feet. Note the singular. 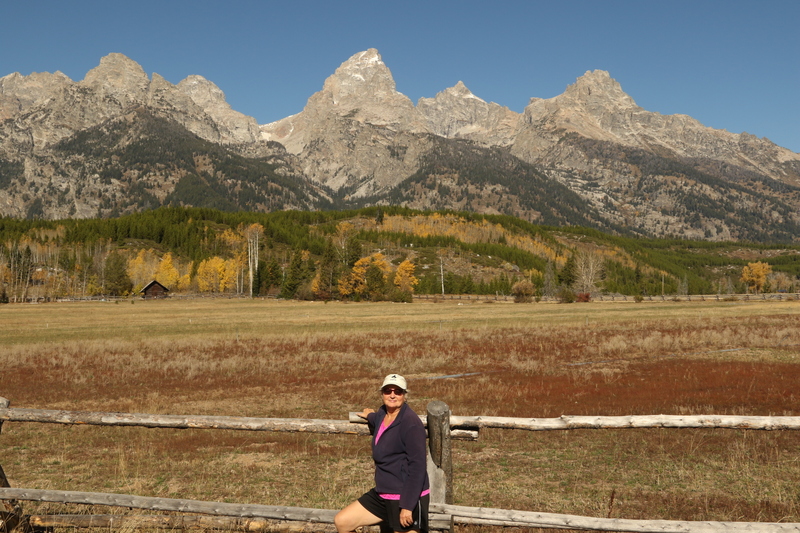 The range is the Tetons, but the craggy precipice that pierces the blue sky the highest is THE Grand one. Which is kind of funny. 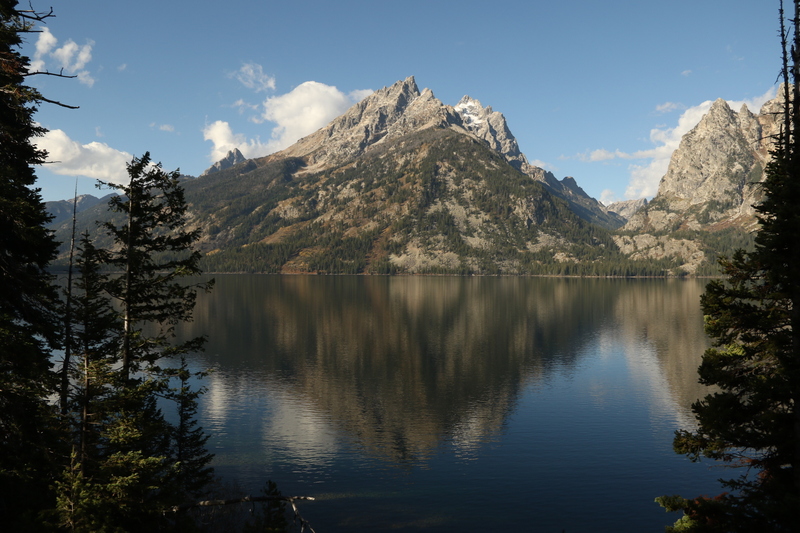 Within a 25-mile ride through the park the perspective changes so radically three distinct peaks can merge into a single apparent mountaintop. 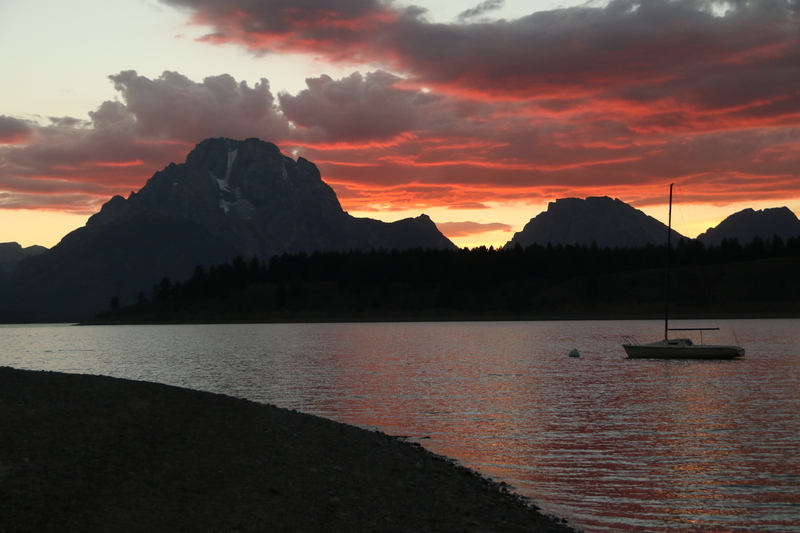 From our campground, Mount Moran rises above Lake Lewis and seems to be the main mountain. Our entry into the park did not bode well. We headed for the Coulter Village non-electric campground (I told you we’d figured that part out) only to find it closed despite wording to the contrary on its website. The alternative electric campground was open, but it cost more than a nice hotel in Sheridan, and didn’t have showers. There is a nice little leg-stretcher of a hike that runs from the campground for a mile or two along a bluff next to Lewis Lake. There’s also a nice bike path that runs next to the road for the length of the range, and it turns out to be a much better way to see the mountains than by driving. 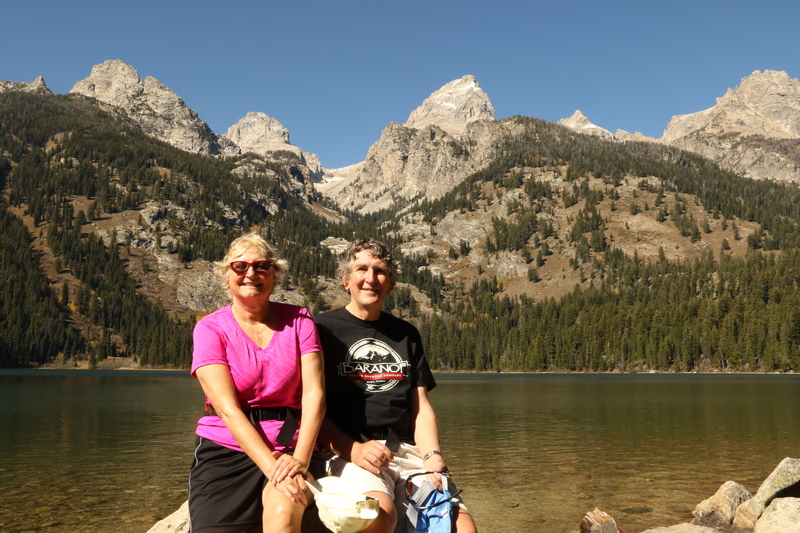 We pedaled the path from near Moose Junction almost to Jenny Lake and back. Back in the campground, we got a good look at the lunar eclipse, as well as a bull elk that was grazing in the woods within 20 feet of us. 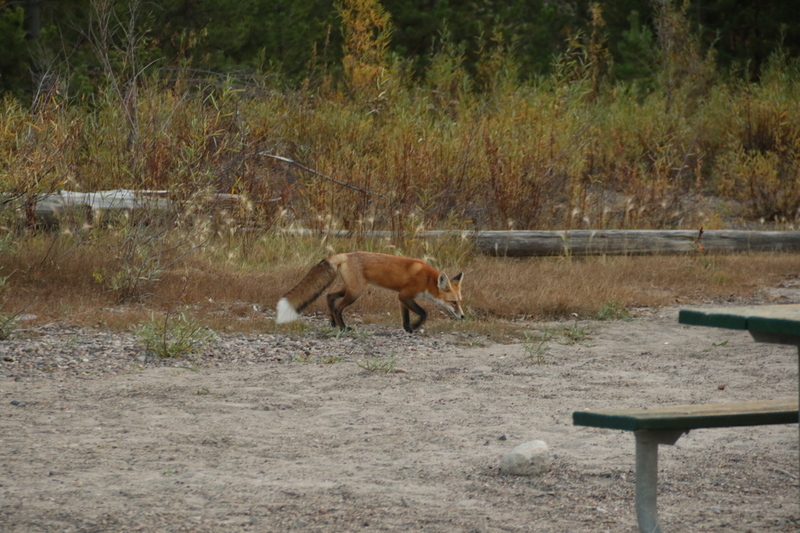 And a very civilized red fox walked right through our site looking for table scraps. We dined the last evening in the local inn’s restaurant, where we struck up a protracted conversation with a couple from, get this, Wilkes County, North Carolina (home of Bunky’s Hill). They travel to Montana for their vacation every Fall. The highlight of the stay was a series of lake hikes. The clouds finally blew away, so we headed for Taggart and Bradley Lakes, then finished off the day with a hike around String Lake. Combined length nine miles, elevation gain 1000 feet, maybe. Both hikes give superb views of the mountains from two different perspectives. The String Lake hike actually hugs the side of the range so you’re looking out away from the Tetons instead of at them. That’s an ironic aspect of the park. If you hike the rigorous trails within the range, you don’t have views of it. 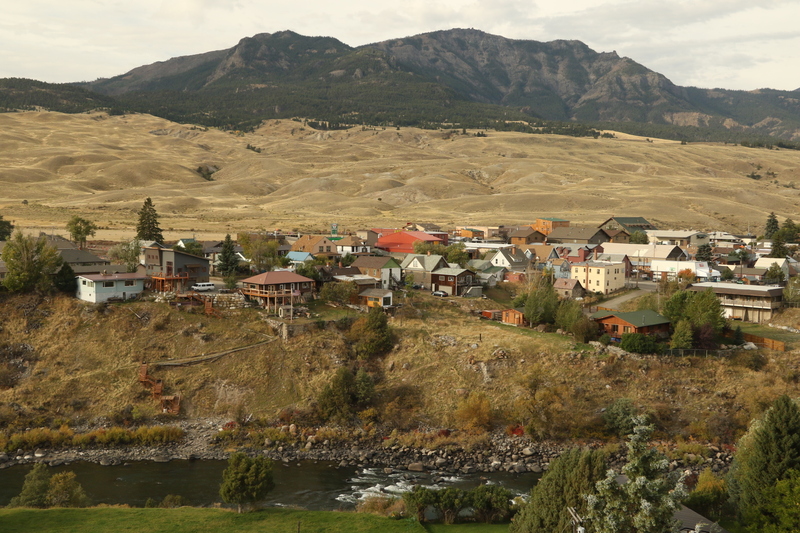 Gardiner, MT. Typical Montana view. 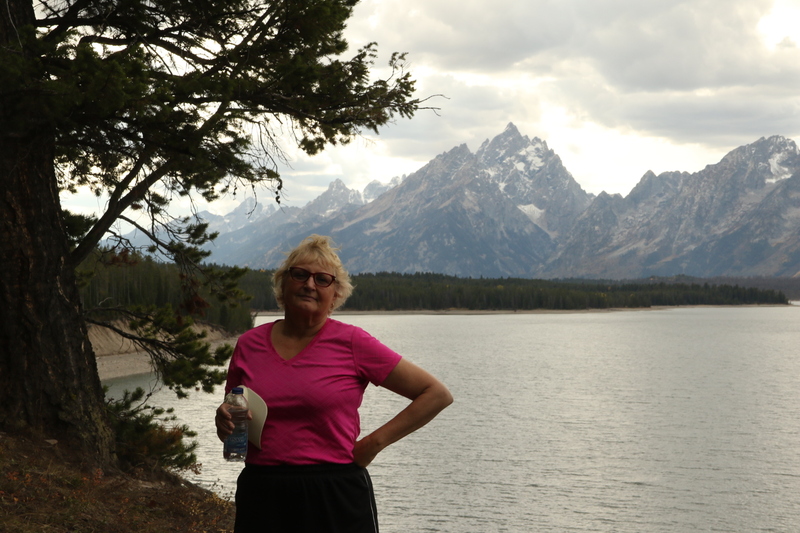 Our choice of hikes was facilitated by the closing of the boat ride across Jenny Lake for the season the day before our hike. Apparently, the weather usually turns much harsher by late September than it did this year. On our way out of the park, we took the “scenic” route along Jenny Lake, which, but for one overlook where the Grand Teton is reflected in the lake, is much less scenic than the main route.